406 pages | 23 B/W Illus. Over the last 50 years there has been a growing appreciation of the important role that farmers play in the development and conservation of crop genetic diversity, and the contribution of that diversity to agro-ecosystem resilience and food security. This book examines policies that aim to increase the share of benefits that farmers receive when others use the crop varieties that they have developed and managed, i.e., ‘farmers varieties’. In so doing, the book addresses two fundamental questions. The first question is ‘how do farmer management practices – along with other factors such as environment and the breeding systems of plants – affect the evolution and maintenance of discrete farmers’ varieties?’ The second question is ‘how can policies that depend on being able to identify discrete plant varieties accommodate the agricultural realities associated with the generation, use and maintenance of farmers’ varieties?’ This focus on discreteness is topical because there are no fixed, internationally recognized taxonomic or legal definitions of farmers’ varieties. And that presents a challenge when developing policies that involve making specific, discrete farmers’ varieties the subject of legal rights or privileges. The book includes contributions from a wide range of experts including agronomists, anthropologists, geneticists, biologists, plant breeders, lawyers, development practitioners, activists and farmers. 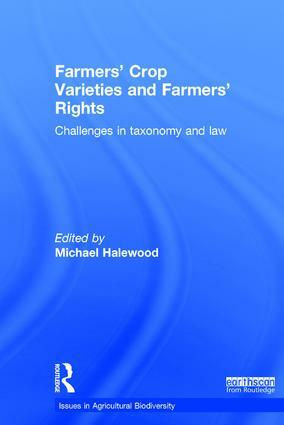 It includes case studies from Asia, Africa, Latin America and Europe where, in response to a diversity of contributing factors, there have been efforts to develop policies that provide incentives or rewards to farmers as stewards of farmers’ varieties in ways that are sensitive to the cultural, taxonomic and legal complexities involved. The book situates these initiatives in the context of the evolving discourse and definition of ‘farmers' rights’, presenting insights for future policy initiatives. Michael Halewood is a senior scientist and leader of the Genetic Resources Policies, Institutions and Monitoring Group at Bioversity International, Rome, Italy. This series of books is published by Earthscan in association with Bioversity International. The aim of the series is to review the current state of knowledge in topical issues associated with agricultural biodiversity, to identify gaps in our knowledge base, to synthesize lessons learned and to propose future research and development actions. The overall objective is to increase the sustainable use of biodiversity in improving people’s well-being and food and nutrition security. The series’ scope is all aspects of agricultural biodiversity, ranging from conservation biology of genetic resources through social sciences to policy and legal aspects. It also covers the fields of research, education, communication and coordination, information management and knowledge sharing.